How fast and effective you learn and improve the forefoot running technique depends largely on surface hardness and that material properties under the bare foot powerfully influences foot strike pattern and foot strike intensity. For instance, hard surfaces such as pavement and hard packed dirt paths provide better perceptual conditions that brings about positive changes in foot strike pattern as compared with soft surfaces. Put differently, the sensory cues linked to running on harder surfaces, especially when barefoot or in thin barefoot-inspired running shoes, may make it easier in bringing more uniformity of all the right mechanics that’ll produce results that matter when learning forefoot running – a fact that doesn’t get enough attention! First and foremost, I think it’s very important to stress that running barefoot is one of the quickest, surest ways to effectively learn forefoot running, but that’s only one side of the story. Running surface has a very important role to play in helping you learn forefoot running whereby running barefoot on hard surfaces, like pavement, naturally produces fast-acting affects at keeping you from landing heel-first (heel strike) as compared to running barefoot on grass. For one, there are major sensory differences between running barefoot on pavement vs grass. Running barefoot on pavement strengthens your focus at helping you maintain the ability to avoid landing with a heel strike simply because it hurts to slam your foot heel-first into the ground, but on grass it feels comfortable and may reduce your forefoot strike accuracy. This is just one of the many reasons running barefoot on pavement clearly has a significant advantage in helping you learn forefoot running more optimally as compared with running barefoot on grass. It may seem like a realistically good idea, but learning forefoot running on soft surfaces, like grass or a thickly matted surface, may backfire as it may not be nearly as effective enough as compared with learning forefoot running on harder surfaces, like pavement. What’s so problematic about learning forefoot running on grass? Because it feels comfortable (like a cushioned running shoe), you may end up mistakenly landing heel-first (heel strike) or directly on top of the arch (midfoot strike), rather than in front of the arch (forefoot strike). This is why running barefoot on grass may make you more resistant to efforts to improve your forefoot strike running skills and may hold you back from fully breaking out of the habit of forcefully heel striking during running. Its tempting to think that running on soft surfaces is something that can really help you out in avoiding injury, especially when learning a new running condition, such as switching from heel strike to forefoot strike running. But, its becoming more well-established that harder surfaces coupled with a little less protection on the feet may be the magic combination that may give you the best possible start at improving your forefoot strike running skills. Soft surfaces such as grass, mats and soft cushioned running shoes was found to cause perceptual illusions during running which negatively altered foot strike pattern and caused foot strike intensity to be perceived as lighter than it actually was! In other words, soft surfaces may cause a runner to unknowingly slam the foot hard into the ground when running because the soft surface provides a false perception of foot strike intensity (Robbins and Gouw, 1996), making hard impacts feel good, but the hard impact is still occurring. Under these conditions, impact-related injuries may be a looming problem. These results make it clear that softer surfaces may make you mechanical clumsy and may seriously weaken your chances of developing a lighter footstep that helps prevent the kind of impacts tied to bone injuries and chronic muscle soreness. Its for this reason that learning forefoot running on harder surfaces when barefoot or in thin minimalist running shoes may do the necessary job at making your forefoot strike effectively lighter and positioned with accuracy. Another troubling aspect about running on softer surfaces is that Robbins and Gouw (1996) reported that the body perceives footsteps as unstable and resulted in an increased risk of inappropriate landings as compared to hard surfaces. Bottom line, our landing stability and forefoot strike acuity seems to be pulled in the opposite direction, resulting in deficits in balance and movement control when running over soft compressible surfaces, but this is not the case for running over harder surfaces. Another good argument against running on softer surfaces for the purpose of injury prevention and whats not in doubt is that from an evolutionary perspective, humans evolved and adapted to walk and run barefoot on hard packed dirt and rough terrain, not overly, plush, soft compressible surfaces, which may suggest why we may tend to mismanage our mechanics and our landing stability falls out of sync when running over soft unnatural surfaces. Though conventional wisdom holds firm that soft surfaces are safer, this belief has been poorly supported. In fact, past studies show the opposite: the harder the surface, the better the balance control, the stronger the reflexive responses, the less factors that lead to high impacts. McNitt-Gray et al. found that well trained gymnasts landed with less impact on a harder surface than on a typical, soft mat because the hard surface provoked the gymnasts to choose their own landing strategy. Because softer surfaces trigger perceptual illusions, the gymnasts who landed on soft, plush mats had compromised movement coordination and balance. Why does soft, cushioned surfaces impair balance and movement coordination? Balance and movement coordination is mostly controlled by proprioception which is a fancy word for the body’s ability to sense and process positional and movement information. Bottom line, proprioception is a prominent feature of human movement and is essential for strong balance and makes critical contributions to motor control and movement coordination. When proprioception is compromised or reduced, so is balance control and mechanical insufficiencies arise which can put additional strain on the body during running. What can interfere with proprioception? 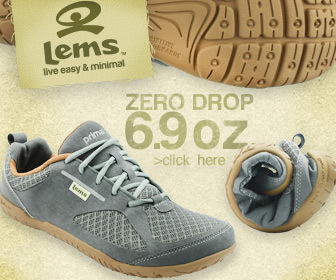 Thick underfoot cushioning! The foot has its own proprioception system that links up though the spinal cord and into the motor cortex of the brain and you stand a lot to gain by improving foot proprioception, which involves improved movement coordination, balance stability and forefoot strike accuracy, by running barefoot or wearing barefoot-like footwear on hard surfaces. 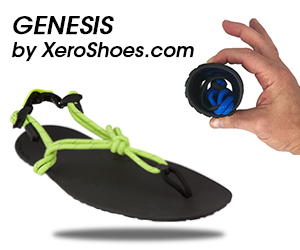 The concept of this is simply based on the hard evidence showing that less material between the foot and the ground directly leads to greater proprioceptive acuity, meaning that you have a stronger sense of the ground, the feet become an even bigger power source for bettering balance control and movement awareness is significantly improved and most important, it throws your foot strike awareness into sharper focus, making it easier for you to avoid heel striking during running. Also note that I can’t overstate enough that foot proprioception seems to be most optimized when barefoot on hard surfaces! In contrast, if proprioception is diminished, like it is with thick underfoot cushioning or running on a matted, squishy surface, the bare feet are unplugged from natural ground-feedback and balance and foot strike intensity control becomes the most seriously affected areas, putting you at risk for injury. How else can we be sure that thick underfoot cushioning is responsible for low level proprioception that leads to a lot of mechanical negatives? 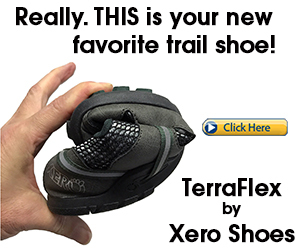 Ongoing research into barefoot vs shoes has found that habitually shod runners who permanently switched to barefoot or a minimalist running condition were more armed with stable landing control, had sharp reductions in impact and heavy loads on the leg as well as less surface forces and made more reactive reflexive control decisions that drove a lighter forefoot strike all of which was the direct effect of the heightened ground-feel necessary to sustain more optimal proprioception. This is why its often better to take the barefoot path when learning forefoot running. If your forefoot running learning progress has been slow, you may want to consider running barefoot on pavement. A lot of final conclusions in many studies have one common theme: routine use of barefoot running on harder surfaces can help you make more rapid progress in learning the proper forefoot running technique –one that’s impact protective and energy efficient as running barefoot is also on record for driving the growth of stronger, taller arches that are more spring-enabled and can store more elastic strain energy more easily. It turns out that running barefoot is a more direct route in producing deep, more quick-acting reflexes that stimulate a forefoot strike less prone to producing high impacts and also allows the foot to hold firm landing stability. 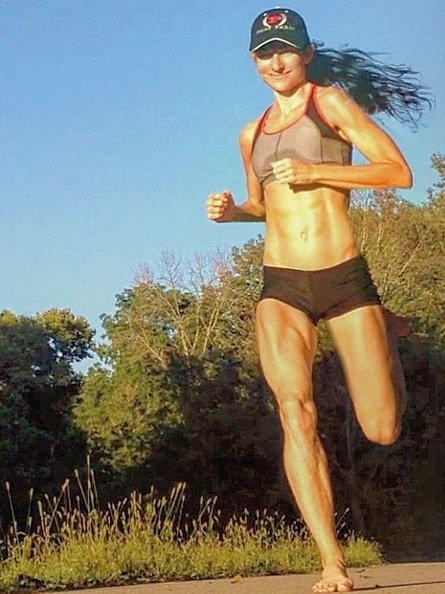 Not only does running barefoot make you more aware of how you’re landing on your forefoot, you’ll also develop more connections in the motor area of the brain that facilitates learning and muscle memory such that the more you run barefoot, the more your forefoot strike gets deeply hardwired into your reflexive system, making it easier for you to uphold good forefoot running form when you run in shoes! The take home message is that to help you overcome heel striking and learn the proper forefoot running technique to the best of your ability as well as to maximize your mechanical defenses, tuning your mechanics to generate less hard impacts on the body and move more swiftly all starts with exposing the bare foot to a dose of natural ground-feedback. Barefoot running really does work best for this purpose and is the best course of action in giving you a mechanical re-boot that remains functional at a near optimum. McNitty-Gray, JL., and Yokoi, T. (1989). The influence of surface characteristics of drop landings. Robbins, SE., and Gouw, GJ. (1991). Athletic Footwear: unsafe due to perceptual illusions.